For the first time, faults with the 1E code can appear at any stage of washing. When a user restarts the washer, the fault signals appear immediately after the start. It occurs even before water gaining. The 1E error indicates a problem with the water level sensor (a pressure switch). In most cases, this means that the user needs to replace the part. There are also “false” alarms when the user can eliminate faults without the help of a specialist. a light bulb of the “cold” washing mode lights up. The E7 error code in Samsung washer was used until 2007. In late products, the same problem refers to the 1E error code. In some washers, a similar problem codes as the 1C fault. These errors are completely analogous to each other. Moreover, the same set of problems cause them. To check this option, disconnect the equipment from the network for a few minutes. Then, reconnect it. If the cause is in the controller operation failure of the washing machine, after a forced reset, the fault signal disappears. Inspect the hose connecting the pressure sampling chamber to the sensor. The last one determines the water level. During washing machine operating, the tube may be bent or separate from the connector. In this case, the relay can not correctly measure the volume of water poured into the tank. In this case, the display shows the 1E error. Straighten or reconnect the hose. This action will restore the normal operation of the Samsung washing machine. If after checking the problem the device still shows the error, probably the hardware is faulty. The failure of some elements most often leads to 1E errors. The table will help you to figure out how to fix the malfunction. The machine does not gain water, the 1E error appears. The hose is clogged, incorrectly connected or mechanically damaged. The relay damage. Check the tightness of the drain hose connected to the output of the washer. Eliminate bendings. Make sure that the hose is intact. Replace the damaged hose or relay (ask a specialist for help). Error codes appear on the display right after the start of the technique operation. The electronic control module malfunction in the washing machine. For an accurate diagnosis, you need the expert’s assistance. If the resistor is burnt out in the module, it is enough to resolder. If a problem occurs in the washing machine processor, you have to completely replace the unit. The technique issues the errors in a short time after the start of washing. The sensor contacts oxidization. The integrity of the wiring of the pressure switch or the electronic unit breakage. It is necessary to adjust the current supply by clearing the contacts. Also, re-twist the wires and replace the tail. Sometimes the relay does not operate correctly when it comes to incomplete contact with the unit electronics. This part determines the level of water. If there is a failure, the 1E error occurs. 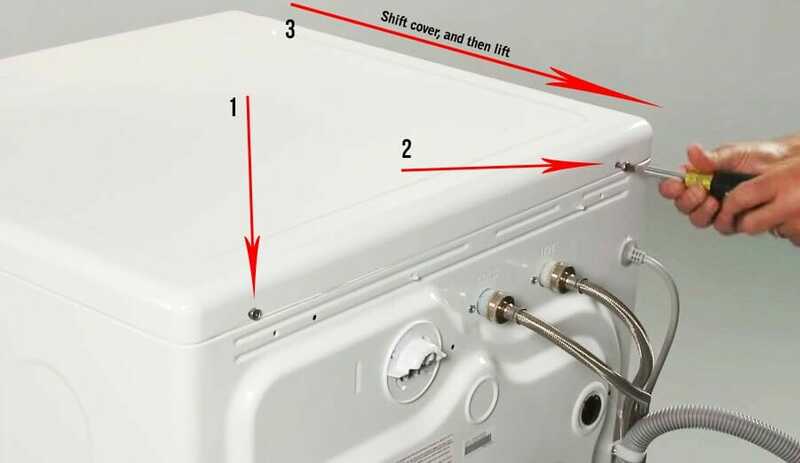 Check whether the electronic blocks of the washer are tightly attached. 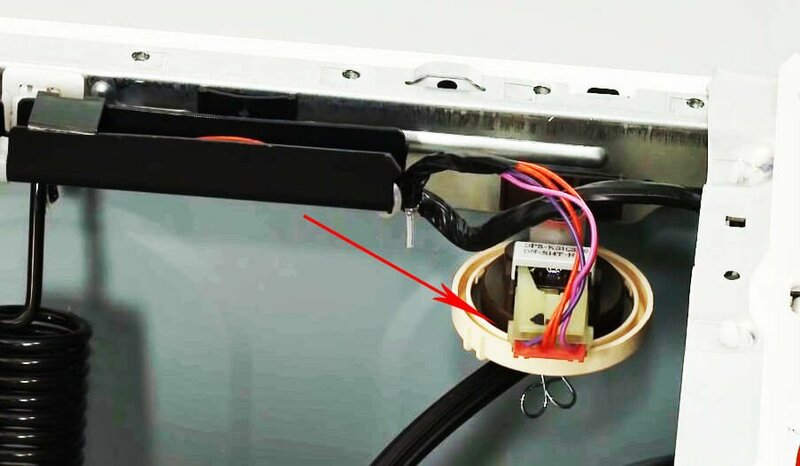 It is much easier to get to the pressure switch than to the heating element or control module in the Samsung washing machine. Shut off the water, disconnect the washing hose of the technique. Disconnect the drain hose from the sewerage lines. Remove two screws. They are located on the rear wall in the upper right and left corners of the case. Remove the top cover of the washing machine. You can find the pressure switch at the top of the machine body. Look closer to the rear wall. It is impossible to confuse this element with some other detail. Having found the pressure switch, check the pressure tube to wear out and blockage. If you can’t find any failures, use the multimeter. Start testing the resistance and the contacts of the water level sensor. Having checked the water level sensor, test the electrical communications. It feeds and connects the part to the control module. Also, check a loop on the entire detail and each wire separately. If the wiring is in order, we are probably dealing with a serious fault in the control module. Burnt out tracks of the control board, triacs, and other semiconductor elements could affect the normal interaction with the pressure switch. You can try to check a loop on them. Perhaps, you will be able to find the defective part. But most likely, searching for a problem and its elimination will be quite difficult. We always recommend delegating faults in the electronics of a washing machine to a specialist. Find a specialist who will fix the breakdown at no extra cost. In conclusion, we should note that the pressure switch can make a lot of surprises. Although, it is one of the most easy-to-repair parts of a washing machine. So, if you face the 1E error in Samsung washing machine, be extremely careful.